On your directions page, the sketch you click on for disasters is what I’m trying to track down. I came across your website while doing some research on the internet. My name is Maurice Carlin. 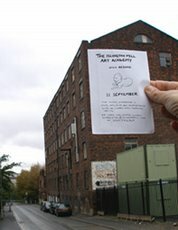 I am an artist based at Islington Mill in Salford. Recently, I have made the discovery of some posters from the miners strike era still displayed on Greengate in Salford, some 26 years after they were originally posted. The posters are dated 1983 and were produced by the New Worker, the publication of the New Communist party at that time. They advertise a number of meetings and events around the country and are emblazoned in large type with the words 'Support the Miners'. They are in amazingly good condition considering their years on the street. I am fascinated by the fact that something as temporary as a poster has survived on the street for so long. They could be considered as a piece of our living history. As part of an art project I am developing, I have been been inviting people whom I think would be interested to see the posters to come along with me to visit them and I am building up a collection of photographs of the visits. If you would be interested in this or you know of anyone who would, I would be more than happy to show them to you and of course it would be great to hear your stories and thoughts. Looking forward to hear from you and with best wishes. Hello Fionn, Could you please put a query on your web pages for me? I have a friend whose husband is pictured on the commemorative plate for Linby Colliery and she has tried everywhere to buy one, without success. She would dearly love to buy him one. 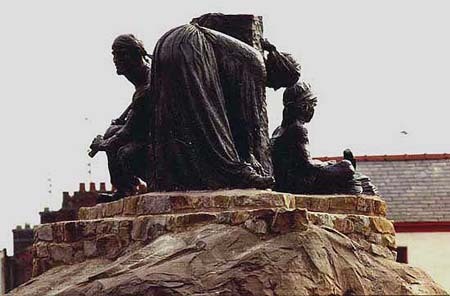 I am writing a book on public sculpture in Cheshire and Merseyside for Liverpool Universty Press and would be very grateful for any information on this monument - particularly the history of the commission. Just wondering if you had any art or information about an artist called Maurice Sochachewsky, he visited Talywain in the 30's and painted many miners. One in particular is called 'Miner and Child’; the man in the painting was called Ivor Clark who died 3 days after the painting was finished, in a mining accident. If you have any other information (or even if you have heard of him!) on this artist I would be most interested, a long shot really, but I am struggling to find out anything else about him. 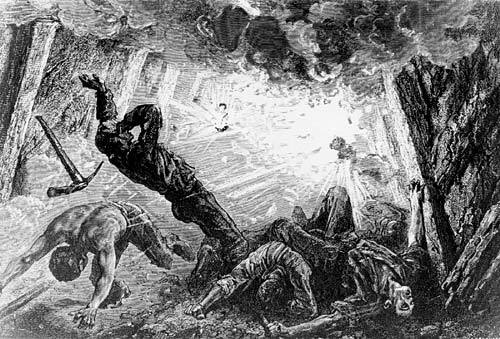 AW was asking about an artist Maurice Sochachewsky, who painted South Wales miners in the 1940s. I have info about him and indeed I own a large painting 'Miner and Child' by Sochachewsky. I don't have access to Alex's email address to send him the info he was seeking. Can you help? You are welcome to send my address to him. A colleague and I are currently working on a new book entitled '8000 Years of Wisdom', a compilation of the memories and anecdotes from 100 octogenarians. A percentage of the royalties will go the Royal Hospital Chelsea's appeal fund. We are seeking anyone who is 79 – 89 years old, from all walks of life, both within the UK and from overseas, who are willing to share their memories and wisdom in this lasting way. Contributors are also being asked for their thoughts on advice for today's younger generation. We would very much like to represent the miners. We have Warwick Taylor (the Bevin Boys Association vice president) but we would love to represent one or two others from different parts of the country - it would be great for them to tell their story.